People may fool you today because it’s April 1st, i.e. the April Fool’s day. But luckily enough Daraz ain’t fooling around as it’s offering you a flat discount and offers on a wide range of Titan watches, thanks to the Titan Brand Day. What exactly is Daraz’s Titan Brand Day? 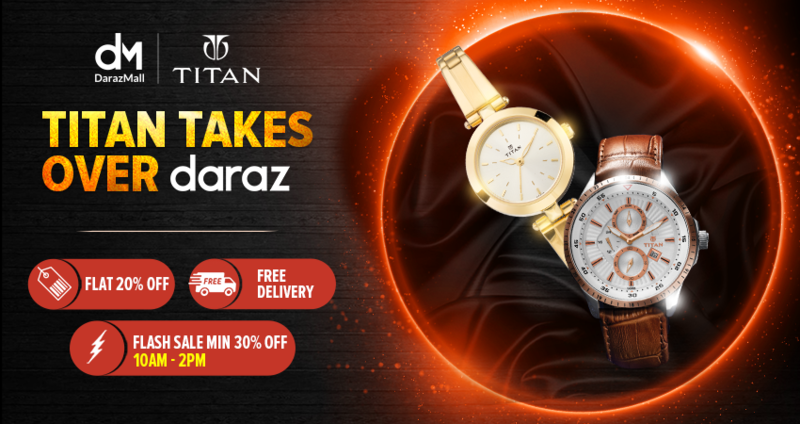 Like any other brand day, Daraz’s Titan Brand Day is an exclusive one-day shopping event where you can shop all the great watches from Titan with special discounts and offers. Daraz is marking April 1(today) as the Titan Brand Day. Then it’ll be back with another brand day with varieties of brands exactly after 14 days in April. And if you’re thinking about the brands; it has got Goldstar, American Tourister, Baltra, Xiaomi, Maybelline, Converse, Rangoli, L’Oréal Paris, Salana, and many more. Coming back to the Titan Brand Day, starting from 12:00 AM it will last till 11:59 PM on April 1, 2019. During the whole time, you’ll get a 20% flat discount on all Titan watches, while between the time of 10:00 AM to 2:00 PM you’ll get an extra 10% off, i.e. total 30% minimum discount on selected ones. There will be collectible vouchers worth up to Rs. 5,000 and free delivery service. And five lucky customers will win collectible vouchers worth Rs. 2,000 with no purchase limit; all of these at the official Titan Store in DarazMall. There’s no great time to give yourself or your loved ones a real gift on April Fool’s day, that too with great discount deals and offers. Click here to visit Titan’s official store in Daraz. Hurry up, before this ends.